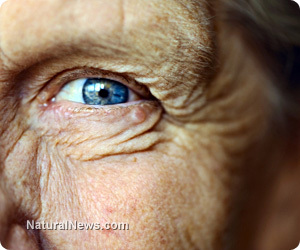 (NaturalNews) As people get older, failing eyesight often becomes an accepted fact of life. Sadly, however, many will eventually lose vision altogether due to age-related degenerative eye diseases. Fortunately, there are ways to protect eyesight naturally. By the age of 50, many are resigned to the inevitability of walking out of the optometrist with their first pair of spectacles, contact lenses or an appointment for laser eye correction. While this may begin with reading glasses, for many, eyesight continues to degenerate to the point of requiring full-time correction, with an ever stronger prescription. According to a "national health interview report" conducted in 2011, as reported by the American Foundation for the Blind, 21.2 million Americans have significant trouble seeing adequately, even with eyesight correction, or are suffering from a complete loss of vision. These more acute conditions are frequently due to age-related degenerative eye conditions such as cataracts, glaucoma, macular degeneration and inflammatory conditions such as retinitis and scleritis. Surgery is usually the doctors' preferred course of action, exposing the patient to additional health risks without any guarantee of improvement but instead with the possibility of making eyesight worse or losing it altogether. So what is the underlying cause of age-related eye degeneration? Why do many people avoid it altogether? And above all, what can be done to prevent it? Virtually all age-related conditions and diseases generally occur due to poor diet, exacerbated by lifestyle. Conversely, raw vegans and others following a healthy, balanced, natural diet and lifestyle not only often appear decades younger but are also extremely healthy with excellent eyesight and other faculties. While age-related disease is a very wide subject, ultimately coming down to diet and lifestyle choices, there are dietary factors that can have a profound influence. One of these factors is oxidation of the skin and organs associated with free radicals, giving rise to the external appearance of aging, such as wrinkles, sagging skin etc, as well as oxidative free radical damage to internal organs and other structures. Eyesight degeneration is no exception, being caused by oxidative free radical damage to the macula and other major eye structures. The key to preventing eyesight degeneration is to prevent oxidative free radical damage to the delicate components of the eye, such as the macula. While there are numerous food- and supplement-based antioxidants that will work well for the body as a whole, the eyes are a special case in that very few antioxidants can actually cross into the eyes to be of benefit. The notable exception is a group of naturally occurring antioxidants known as "xanthophylls" which are normally concentrated in the eyes, particularly the macula in younger years, but can become depleted later in life due to decades of poor diet. Dark greens: Kale, collards and spinach. Rich in lutein and zeaxanthin. Spirulina: Very rich in lutein, zeaxanthin and beta-carotene. Astaxanthin: Highly effective antioxidant supplement with particularly profound benefits for protecting the eyes. While there is no substitute for a balanced, natural diet including dark leafy greens, regular supplementation with spirulina and astaxanthin can be of considerable benefit in protecting eyesight, particularly in advancing years.